You are here: Home / DISCOVER EVIDENCE / About the Bible / The Gospel of Barnabas: Secret Bible? Does a “secret Bible” discovered in a Turkish smuggling sting contain the real truth about the identity of Jesus Christ? 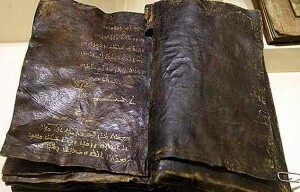 According to a Turkish official, a 1,500-year-old ancient leather-bound text, secretly hidden for 12 years, could be an authentic version of the Gospel of Barnabas. Let’s look at what the Gospel of Barnabas says about Jesus’ deity. “In the beginning was the Word, and the Word was with God, and the Word was God. He was with God in the beginning. Through him all things were made; without him nothing was made that has been made….The Word became flesh and made his dwelling among us. We have seen his glory…”.